Liyana and Maharasyi in a fighting scene. OUR neighbour to the northeast is known internationally for its oil and gas industry and tax-free status for its citizens. Now, Brunei can add its first international feature film — Yasmine — to this list. The movie has taken part and competed in various international film festivals around the world, receiving favourable reviews from audiences for its coming-of-age tale of a young girl and her relationship with her father. However, first-time director Siti Kamaluddin’s first feature film is more than just another martial arts themed teen movie – it deserves a closer look for the many firsts it has achieved for the fledgling Brunei film industry. There is a saying t if you are going to do something new, you might as well do it right, do it well and not be afraid to bring the experts in. She recruited some of most respected talents in the Asian film industry to join her cast and crew, including famed stunt coordinator and action director Chan Man Ching – known for his work with Jackie Chan in films such as The Legend of Drunken Master 2, Rumble in the Bronx, and the Rush Hour series). The movie was shot entirely in Brunei and received funding and support from the Brunei government to film in various locations. Among the things Siti set out to do was to highlight the local Brunei culture and landscape but making sure the story could appeal to audiences beyond language and cultural boundaries. “As we’re not from a film nation, I am influenced by many directors from different countries. I grew with a lot of American and even Malaysian movies. I never thought of film as something which should and only be local. Yes, I think film should have a local flavour but film is a universal language and we’re all global citizens,” she explained. “So for myself, I believe in making movies in Brunei but they do not necessarily have to be just for Brunei audiences. I want to make movies for the world to enjoy. The filming itself took one and a half months, but preparations began long beforehand. It took Siti about one year to write and develop the characters and story line. For her research, she visited schools in Brunei to talk with students to help her create characters that audiences could relate to. She also read as many books as she could on silat and roped in 1999 SEA Games silat gold medalist Mohd Shahepul Radin Tajudin to train her actors and actresses, including first timers Liyana Yus and Nadiah Wahid who plays the lead character Yasmine and her schoolmate Nadia respectively. For Liyana and Nadiah Yasmine was the first movie they have ever acted in. They also did not have much experience training in martial arts prior to joining the cast. Thus, in addition to learning their lines and acting their scenes, they also had to train and learn how to fight with silat for about a year. Nadiah told thesundaypost the daily training sessions with Mohd Shahepul Radin was very challenging physically and mentally but they were determined to adapt to its rigours. “Training with coach (Mohd Shahepul Radin) was not easy, but at the same time, I learned a lot from it,” shared the young actress who scooped up the Best Supporting Actress award for her performance in Yasmine at the Asean International Film Festival and Awards (Aiffa) 2015 held in Kuching recently. “The training brought us closer together as colleagues and friends because we went through so much together,” Liyana added. Siti Kamaluddin directing on set. Asian martial arts movies are not new to the global film community,but silat has not been featured as prominently on the big screen compared to more well-known martial arts such as Wing Chun, Shaolin Kung Fu, and Muay Thai thanks to the likes of Asian superstars such as Bruce Lee, Jet Li and Tony Jaa. This is despite the fact that silat is one of the most popular forms of home-grown martial arts in Southeast Asia. Siti shared that one of her reasons for building the movie’s story and characters around the martial art was to show to the international audiences how beautiful silat is – not just as a martial art, but as an art form in itself that is as much a reflection of its ancient roots as well as the character of its wielder. “(Action director) Man Ching helped to choreograph the action, according to the emotions of the story. “For example, the darker Yasmine who is lost, her movement is different and you can also see this in Liyana’s acting through her movement and voice. And when she comes into herself and finally understands who she is, her movement and expression also show this. But this is also because we have a wonderful choreographer to help us,” she said. It was Man Ching’s first time choreographing fight scenes for silat but he was undaunted. “For me, it’s the same as kung fu — just that how you combine it for the camera into a beautiful picture. I enjoyed it. It’s beautiful, like dancing,” he shared. 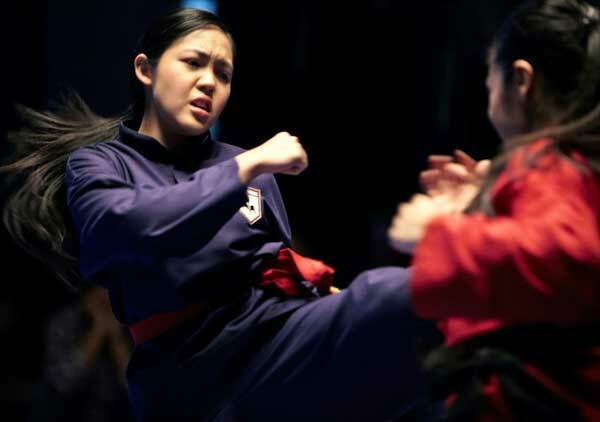 People have asked Siti why she chose silat for the movie. “I could have chosen any other martial art but I love silat. It’s so beautiful. There’s the full contact (striking) and then there’s the bunga (stylistic flourishes). I really love the bunga. You can almost lose yourself in it. It’s a form of expression — like dancing. It’s such a pity we don’t focus more on this part of silat. For Siti, sharing the love for silat is just as important as the action sequences. “We really went back to the roots. Although the character Yasmine is taking up silat from the sports competition point of view, we also talked about the love of silat. When you do silat, you have to do it from the heart. “With silat, there’s a whole other connotation involved, ilmu batin – which is almost like chi. It can be quite dark. In this modern day when the youth are growing up with Twitter and Facebook, we are losing touch with our own martial art. “The students I met when I was visiting the various schools were doing taekwondo, karate, muaythai, aikido. It wasn’t seen as cool to be doing silat. That sealed the deal for me and I decided I had to do the movie to show how cool silat could be,” she shared. Actors and actresses — Roya Sungkono (Ali), Nadiah Wahid (Nadia Malik) and Liyana Yus (Yasmine). Much has been highlighted about how much ground the movie has broken although it remains to be seen how much of an impact it has on the Brunei film industry in the long term. However, the future looks promising. Siti expressed her deep and sincere thanks to the Brunei government for their strong support of their local film industry as well as towards the youth which enables the movie to come to fruition and have the impact it has had, not just on Bruneian but international audiences as well. Sarawakian film-makers are most certainly paying attention to the developments happening in our neighbour’s film-making industry. A local director and producer told thesundaypost that Malaysia could benefit from emulating the Brunei government’s approach to supporting the local film industry. He pointed out that among the many obstacles they faced were lack of funds, bureaucratic stipulations as to script and content and entrenched favouritism which see the better projects and funding always going to the same companies and names. This raises the barriers even higher for young film-makers to break through, especially those whose cinematic aspirations are far from the typical mainstream fare that permeates mainstream Malaysian cinema of love stories, slapstick comedy, horror superstition, and gangster-action flicks. “We have to ask why they (Brunei) are able to find success so quickly even though they are a smaller country with a smaller market and why we are finding it hard to break through even though we have a larger market and a bigger film industry,” he said. Action director Chan Man Ching, Liyana Yus, director Siti Kamaluddin, Nadiah Wahid, and assistant director Fai Zaini.